Briefly blanch your cashews to soften them up. Blanching is the process of briefly submerging food, usually fruits and vegetables, in boiling water. This process cooks the food slightly, softening it up and often making skins easier to remove. 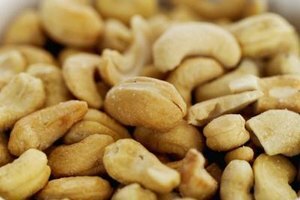 Some recipes calls for nuts, like cashews, to be blanched. You can buy cashews already blanched, or tackle the process on your own. Because cashews have no skins, that's one less thing to worry about. It only takes a few minutes and your cashews will be softened and ready to use. Fill a large, wide pan with water and bring it to a boil. Add the cashews to the water and allow them to boil for one minute. Drain the cashews in a colander. Rinse the blanched cashews with cold, running water to stop the cooking process. Arrange the cashews in a single layer on a baking sheet to allow them to dry. To speed up the drying process, you can place the cashews in an oven set to the lowest temperature until the nuts are dry to the touch.